In this article we discuss SEO strategies for Startups with content fewer then about 50 pages. This article will provide a few strategies to help these companies to rank highly in search engines for only a few keywords and terms. The objective of this article is to provide the basics in the most efficient manner possible. Pointers for more information will also be provided. Setup a 301 redirect form your non preferred URL domain to your preferred URL domain. A 301 redirect is a permanent redirect from one URL to another. 301 redirects send site visitors and search engines to a different URL than the one they originally typed into their browser or selected from a search engine results page. Note: most large corporations keep the www version of the URL. Verification is the process of proving that you own the site that you claim to own. We need to confirm ownership because once you are verified for a site, then you have access to its private Google Search data, and can affect how Google Search crawls the site. Sign-up or enable email forwarding in order to receive critical messages from Goggle e.g. hacked, crawling, malware issues. Any issues encountered by Google are forwarded to your email via the webmaster tools. Some domain names might have a bad reputation with Google (they might have been part of the network, involved in illegitimate or spam-my techniques, etc.). In this case one has to submit a reconsideration request via Google Webmaster Tools. – Do a keyword check in the Webmaster Tools. See if negative words or terms are associated with the keywords for your site. The Fetch as Google tool enables you to test how Google crawls or renders a URL on your site. You can use Fetch as Google to see whether Googlebot can access a page on your site, how it renders the page, and whether any page resources (such as images or scripts) are blocked to Googlebot. This tool simulates a crawl and render execution as done in Google’s normal crawling and rendering process, and is useful for debugging crawl issues on your site. Give the Bot a try here. If you’ve recently added or made changes to a page on your site, you can ask Google to (re)index it using the Fetch as Google tool. An additional part of this feature/tool is that one can inform Google to not just crawl, but to also index the page. 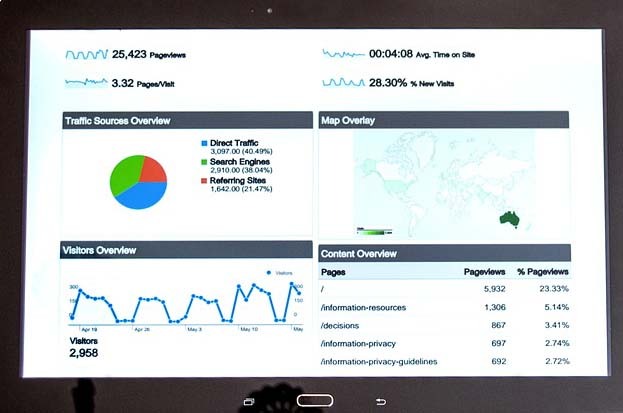 Include Google Analytics or another form of analytics on your website. These are tools that track and report website traffic. SEO consultants and specialists can use this data to outline a more robust SEO strategy for your site. A website has to be a great experience for customers and users. The overall strategy has to cover the following areas: Utility, Navigation, Focus, Objective, Sales Cycle etc. Research common terms and keywords using the Google AdWords Tool. Include these keywords in pages titles and content. Include reviews on your website. Allow customers to include to review products. It also helps to answer customer questions and to include customer satisfaction policies on the website. Posted in Ecommerce, Marketing, SEO and tagged startup.